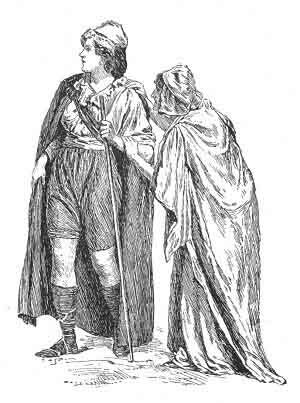 AFTER the capture of the wicked enchantress Acrasia, Prince Arthur and Sir Guyon travelled long and far together in all sorts of dangerous places. They met with many perilous adventures, which won them great glory and honour, for their aim was always to relieve the weak and oppressed, and to recover right for those who had suffered wrong. At last one day, as they rode across an open plain, they saw a Knight spurring towards them. An aged squire rode beside him, and on the Knight's shield was emblazoned a lion on a golden field. 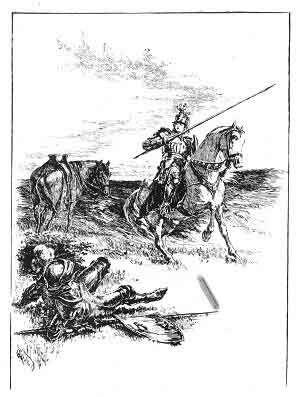 When they saw him, Sir Guyon begged Prince Arthur to let him be the one to face the attack, and the Prince agreeing, Guyon levelled his spear and galloped towards the Knight. They met with such fury that the stranger reeled in his saddle, and Guyon himself, before he was aware, was hurled from his horse. His fall filled him with shame and sorrow, for never yet since he bore arms had such a disgrace happened to him. He need not, however, have been so grieved, for it was no fault of his own that he was dismounted. The spear that brought him to the ground was enchanted, and no one could resist it. But Guyon would have felt far more sorry and ashamed had he known that the Knight who overthrew him was in reality a maiden. The stranger was no other than the famous Princess Britomart, daughter of Ryence, King of South Wales. She was roaming the world in search of Artegall, the champion Knight of justice, whose image she had once beheld in a magic mirror given by the magician Merlin to her father. So grand and noble was the image of this splendid Knight that Britomart felt she could never rest until she had seen him in reality. She dressed herself in the armour of a knight, and her old nurse, Glaucé, disguised herself as her squire, and together the two left the court of King Ryence and wandered through the world in search of Sir Artegall. Sir Guyon, full of anger at his fall, and eager to revenge himself, rose hastily, drew his sword, and rushed at the foe; but his attendant, the Black Palmer, who had been his faithful companion and guide in all his former adventures, implored his master not to run into fresh danger. By his great wisdom he could tell that Britomart's spear was enchanted, and that no mortal power could withstand it. Prince Arthur joined his entreaties to the Palmer's, and they both spoke so wisely that Guyon's anger melted away. Britomart and he became reconciled, and swore a firm friendship. In those days, when knights fought together, it was often not at all in malice, but only to test their strength and manliness. The one who conquered won much renown, but the vanquished felt no spite nor envy. It is a great thing to be able to lose with a good grace, without becoming sulky and disagreeable. Later ages might do well in this respect to learn a lesson from the days of chivalry. So Britomart, Prince Arthur, and Sir Guyon then travelled on together in the most friendly fashion, seeking further adventures. For some time nothing happened, but at length they came to a wide forest, which seemed very horrible and dreary. They rode a long way through this, but found no track of living creature, except bears, and lions, and bulls, which roamed all around. Suddenly, out of the thickest part of the wood, something rushed past them.